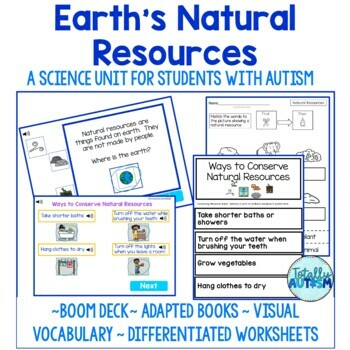 Earth's Natural Resources Unit for students with special needs or autism. Aligned with the 1st grade SOLs. This is perfect if you teach a multi-grade level class or in a self-contained classroom. Activities are hands on and great for visual learners! Check out the Growing Bundle of Science Units! See a video preview of each page!